In these days of heightened security needs at public places and transportation hubs, security managers are constantly on the lookout for effective methods of safeguarding those facilities and the public and businesses that are dependent on them for getting people and things from place to place. CVG’s new wooded area equestrian trail alignment. Courtesy CVG. Equestrians have been riding trails at Cincinnati Norther Kentucky International Airport (CVG) since a program for that purpose, along with its first trail, were developed in 2005 and opened in 2006. Two other large-scale airports – the George Bush Intercontinental Airport in Huston, Texas and the Metropolitan Nashville International Airport both had established trail rider programs that served as inspiration and models for a similar program at CVG. 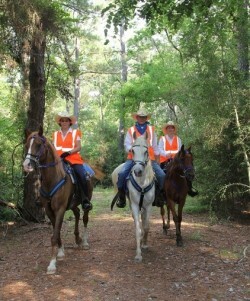 As you might guess, all three airports recognized that horseback riders trained to keep an eye out for unusual activity or conditions in the more remote areas of the property could be of great benefit to horsemen, who get a great trails experience, and the airport, which derives heightened security from the trail riders’ presence. The grounds of the CVG are partially covered in fields and wooded areas. 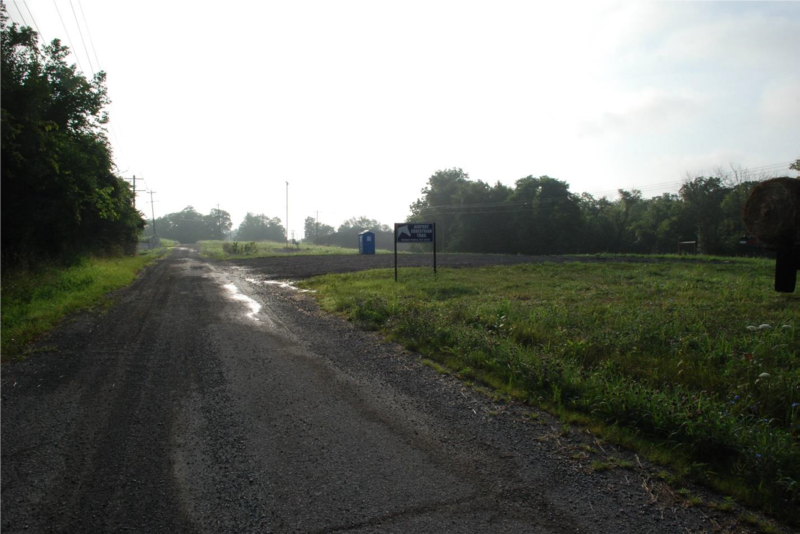 Though the trails were relocated within the airport property due to construction of Aero Parkway, a new trail system was opened in August of 2016 in a new location that runs for 9 miles at its perimeter, and several connector loops provide a varied riding experience. 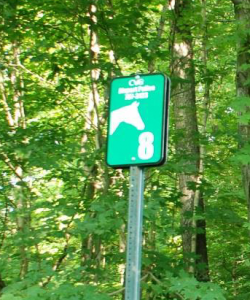 Local equestrians and riding clubs are enthusiastic about the trails, according to Ann Gibson, president of the Indian Hill Equestrian Club, which has 75 miles of its own trails. The trails are well-signed with the airport’s own equestrian logo. 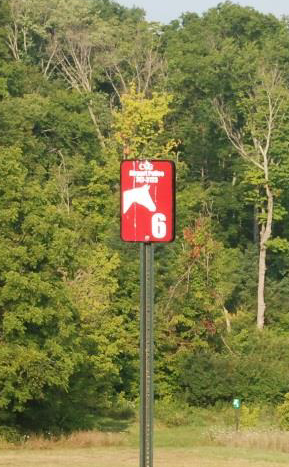 CVG’s Equestrian Trail Signage. Photo Courtesy CVG. ELCR spoke with Mindy Kirschner, CVG’s Media Relations manager. Ms. Kirschner described the equestrian participation process for the program. Enrollment in the program has strict regulations and requirements for getting an ‘Equestrian Badge’, just as any airport employee would be subject to, including orientation classes and security checks through the Department of Homeland Security’s threat assessment background check. The program is limited to 300 badge holders, and currently has about 130 riders enrolled. The limitation is mostly due to available vehicle and trailer parking space. CVG’s Trailer and Vehicle Parking Area. Photo Courtesy CVG. Airport Rangers on the Trail at Houston’s George W. Bush Intercontinental Airport. Photo Courtesy Airport Security. The George Bush Intercontinental Airport in Houston, Texas has a long-standing equestrian program. In a conversation with Huston Airport System’s Public Relations Officer Bill Begley, we talked about the beginnings of the program. In 2003, “then airport director (Richard Vacar) was a member of the equestrian community here in Houston, and thought it would be a great idea to open our areas to the greater airport community. The idea was accepted enthusiastically,” said Begley. 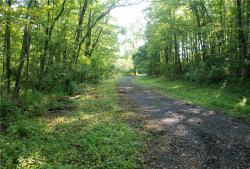 With the help of community members, local equestrians and airport staff, a trail system was cut into the large woodland, part of the 13,000 acre airport property, creating 54 miles of trails, which connect to another 25 miles of perimeter fence trail. 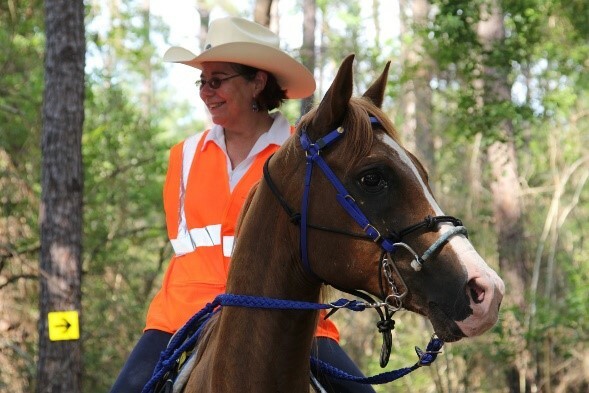 The county has a rather extensive equestrian trail system near the airport, including miles of trails through natural areas along Cypress Creek and Spring Creek. Part of the program’s popularity may stem from the “rather extensive equestrian trail system near the airport”. The Rangers also take part in related events, helping to maintain good relations with airport neighbors and the community. “It (the program and trails) has been widely supported (in the community) and we have had support from the media. Our previous mayor invited local and foreign dignitaries for rides along the trails,” said Begley. Josh Samic, HAS External Affairs, Volunteer and Logistics Liaison, accepts applications for the Rangers program. He says that the trail system itself performs many functions. While providing an extensive riding opportunities for the Rangers, their eyes and ears help to provide additional security for the perimeter and more remote areas of the airport. The woodland has been kept intact, a factor in the protection of the local watershed. “The trail also acts as a fire break,” says Josh. It’s kept clear through riding activities and maintenance that is undertaken by the airport staff. An additional service provided to the equine community is an enclosed, fifteen acre evacuation field where horses threatened by area flooding may be temporarily accommodated. When I spoke with Josh Samic, he was standing at the entrance to that field watching over several horses that had been transferred in due to recent flooding, waiting for the next trailer load of equine rescuees. Clearly, both the community and the airport place great value on the equestrian uses of the airport’s extensive property, and have worked to keep it accessible. For more information on the Airport Rangers Program, go to http://www.houstonairports.biz/airportrangers. Metropolitan Nashville International Airport Equestrian Program – A Successful Program that Gradually Disappeared. According to a 2006 article written by Nancy Brannon called “Jetways and Equestrian Ways Combine”, the Metropolitan Nashville International Airport Authority initiated and provided facilities and trails for an equestrian program allowing volunteer riders to utilize the eastern perimeter of the 4500 acre airport. The program had two goals: to provide additional perimeter security for the airport, and to give equestrians a quality place to trail ride. Sergeant David Frensley was in charge of the program but is now retired. ELCR spoke with the Airport’s Ana-Maria Frank, who has handled paperwork for the now defunct program in the past. The Airport closed the program in 2015 due to lack of participation on the part of equestrians. In the first few years, the program exhibited great participation. That level gradually fell off to the point where only two applications were processed in its last year. Ms. Frank said the application and background check had to be renewed every year and that may have reduced the number. Also, there were no outside trails in the area to allow for extended riding, thought there was a trailhead and parking. Were there other factors, such as lack of proximity to equine properties, the retirement of Sgt. Frensley, traffic congestion, etc., that contributed to the program’s demise? The program had many advantages, not the least of which was the added security in wooded areas that patrol vehicles couldn’t easily reach. The wooded trails provided a nearly bucolic riding environment for equestrians. Trails were clearly marked with several areas to water horses at both ponds and troughs. People were coming from up to 200 miles to ride. I asked Ms. Frank if there had been inquiries from other airports interested in instituting a similar program. She said that they had been contacted but that to her knowledge, none of the airports had moved ahead with implementation. It seems as though Nashville has lost a wonderful trail resource, and it is doubtful that the airport will re-activate the program at this point in time. The Georgetown Airport, located just outside of and above Georgetown, California, sits above beautiful Canyon Creek. Though a hiking and equestrian trail encircles the outer boundary of this local airport, it is link to an extensive system of area trails on private parcels that ensures continued use of the airport area for riding. 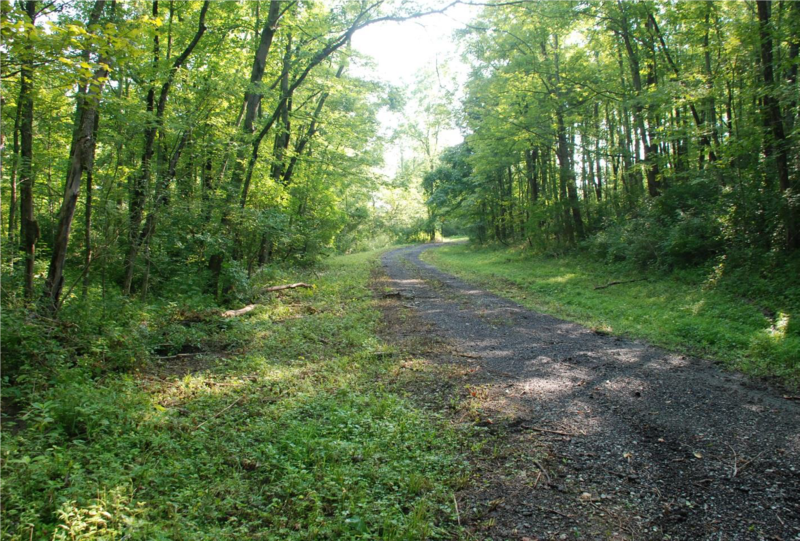 A few formal trail easements have been developed and maintained on some of the parcels near the airport boundary through a partnership between the Georgetown Divide Recreation District (GDRD) and GDETF. These formal easements as well as informal private property agreements, provide trail access for hikers and equestrians. However, if parcels go on the market, or if there are absentee owners, there is currently no guarantee that passage through specific properties will continue to be allowed. Recently one or two parcels have been gated off, requiring trail rerouting. Scribner said that GDETF is responsible for most of the trails around the airport. They purchased, erected and manage the use of required gates, and have placed trail use regulation signage provided by GDRD. Trailers can be parked at the airport’s west edge. Scribner said that “equestrians can sort of ride through the airport from their trailers along a gravel road,” but are discouraged from using the picnic grounds and facilities “except for the occasional emergency”. Interestingly enough, one of the trails runs up to Dru Barner Equestrian Park, located in the Eldorado National Forest, an equestrian friendly campground with nearly 50 horse campsites and some limited facilities. From there, riders can access a several hundred acre joint motorcycle/equestrian trail system which is surprisingly user-conflict free. By partnering with private landowners, GDRD, diverse trail users, the community of Georgetown and the National Forest Service, GDETF has become steward of a remarkable trails system with a local airport at its crown. Find information about Georgetown Airport and Divide area trails at www.GDETF.com. A substantial area of unused land on or surrounding the airport property where a good-sized trail system can be developed is necessary. It should include shaded and open areas, varied terrain and potential fenceline/perimeter areas to ride. A security need. The airport should perceive that the benefit of ‘extra eyes’ that horseback riders bring to the grounds contributes to the security operations of the facility. Staff members that are interested in an equestrian program and are willing to support it; equestrian groups interested in riding airport trails that are willing to work with airport staff to bring about a program; community support and good communication between all involved. Capacity to develop a program that includes trail rider trainers that have both security and equestrian backgrounds, and continual trail rider background checks. Initial funding for trail development, a commitment on the part of the airport and/or other organizations and agencies to build sustainable trails and a mechanism to maintain them. Proximity to outlying or connected trails, basic parking facilities for trailers, and horseback riders and horse owners living nearby. In cases where the airport is associated more by proximity to trails than by a trail system within the airport itself, such as the Georgetown Airport, developing a good relationship with airport security and staff that may include sharing of parking/trailer and facilities would be helpful.